The large white circle is something called a 3 inch test cap. I found it at a nearby Menards, a home improvement warehouse, in the PVC pipe section. It's around $0.50 USD. The wood disk was found at a local craft market for again around $0.50. Pick the one that is the smoothest. 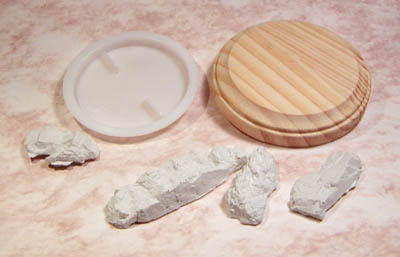 The white rocks are plastic casts from a mold used for model railroad terrain. Next, we prepare the test cap. The next step is to get the test cap prepared. The test cap that I found needs to be trimmed. First, remove any tabs that are inside the cap. Second, cut off the rim. Sand down the test cap to make it a relatively even height. You might as well sand the wood block smooth at the same time. Next we attach the test cap to the wooden display case. Now we want to make a display base that we can easily separate the test cap from the wood base. Make a paper circle and determine the center of the wood block. 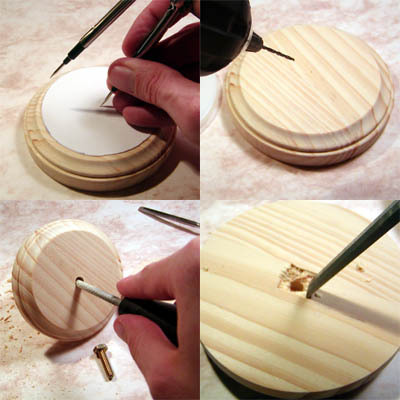 Drill a hole into the center of the wood block -- you may want to first drill a guide hole. The final hole might not be exactly in the center -- use a rat tail file to cut a whole to the middle. You'll also need to cut a hole on the bottom side large enough to fit the head of the bolt inside the wood block. Glue the bolt into the center of the wood base with some epoxy. Center the test cap onto the base. I like to make the nut a bit higher into the base, so I set it on top of a few pieces of balsa wood. Next, we glue the parts together and attach the miniature. Now we finish gluing the base together. Take some epoxy and glue together the wood and nut. Make sure that you don't glue the test cap to the wood base, nor glue the nut to the bolt! We want to make it so these things can be easily seperated. You can disguise the nut by drilling a hole in a plaster rock and covering it. Continue gluing the plaster rocks to the base. By not gluing plaster stones on the whole base, you can later use clear resin or something to make the base a bit neater. Pin the miniature to the base. Continue with normal basing techniques, such as sand, resin, etc. Stain the wood base. 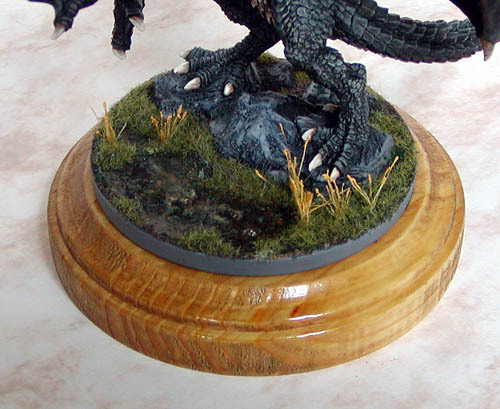 After you paint the miniature base, you'll have a great inexpensive display base!